Mind's Eye is a progressive band with a strong sense of melody. Although making their own blend of heavy metal and progressive rock you can still hear influences from bands like: Rush, Yes, Queensrÿche, E.L.O, Winger, Toto and Genesis. The band started in 1992 when Johan Niemann (bass) and Daniel Flores (drums & keyboards) met Fredrik Grünberger (guitar)Before creating this new band they first called Afterglow, the three of them had played in different local bands in Stockholm while studying music in high school. When not writing music and rehearsing, Fredrik took lessons with Jan Granwick (Glory) while Daniel and Johan studied with local teachers. After playing together for about a year the band met singer German Pascual and made a self-produced, self-financed promotion CD named "Afterglow". The CD contained four of the eight songs recorded, and was very well received by the Swedish press, especially by Swedish journalist Janne Stark. The CD was also voted Demo of the Year by the Swedish magazine Backstage. Janne Stark worked with the band in trying to get labels interested. Even though some labels showed interest in signing the band, in 1996 it was still without a contract. When German Pascual left the band they started to try out new singers. Afterglow recorded a demo with two different singers. The singers where Robert Forse(Head's or Tale's) and Thomas Vikström (Candlemass), But things didn't work out the way it should and Afterglow was forced to search for a new singer. They auditioned over 30 singers, and Johan Falhberg (Jaded Heart) was selected as a new band member. The band also changed their name to Mind's Eye since "Afterglow" already was taken by a German death metal band. 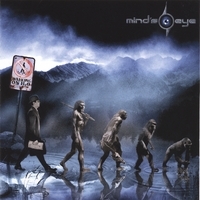 In 1997 Mind's Eye finally got a deal with a record company and recorded their first CD "Into the Unknown" for the American label, Sensory (a label of the Lasers Edge group). The album was well received in both American and German press. The CD was distributed in the States by Century Media. Meanwhile, Johan Niemann and Daniel Flores studied music production and engineering at the Stockholm Music Conservatory with teachers like Roger Krieg (Ulf Lundell, Stefan Andersson) Olle Olsson (Meja, Snoop doggy dogg, Backstreet boys) Due to musical differences the band had to change singers again. The new singer, Andreas Novak, also studied at the Stockholm Music Conservatory with teachers such as Daniel Zanger-Borsch (Alien, Crosstalk) and Johanna Nyström (The real group). Though Johan, Daniel and Andreas studied hard it never got in the way of writing music with Mind's Eye. With a singer that fits their music they continue to write and rehearse in the studio outside Stockholm where Yngwie Malmsteen used to rehearse when he started his career. Their second album "… waiting for the tide" was recorded in 1999. In order to be in more control of their music, the band decided to release their second album on their own label "Round Records" with the assistance of project manager Håkan Kaneberg. The album got rave reviews, and opened several doors for Mind’s Eye, who now owns great reputation and respect in many magazines as one of Sweden’s best new progressive rock acts. Songs like “Calling (father to son)” got great radio air in both Swedish and American stations. In May 2000 Johan Niemann decided to quit Mind’s Eye in order to pursue his career with band Therion. The rest of the members wished him luck with that. In September 2000 Mind’s Eye decided to compete in the European Progpower competition. Mind’s Eye came in third place of ten bands. Most of the bands were big European names so off curse that was an honor for the guys. The same month MNW records and Record Heaven had heard the album and decided to release the album in Europe. In October 2000 the band contributed to Adrenaline records “Warning: Mind’s Of Raging Empires”- A tribute to Queensrÿche, with the song “I will remember”. The song got amazing reviews waving the Mind’s Eye flag around the world, showing how strong their musical abilities are. January 2001 Johan Niemann was asked to join Mind’s Eye again, he accepted and the band continued to fulfil their third album. During February until May Daniel Flores and some friends started to build the “Sheep Valley Studio”. The studio was completed in late May introducing Mind’s Eye into hard disk recording, a new experience for the band. With a new found studio Mind’s Eye now felt the urge to record a new full-length album again, their third album with the tittle “A work of art” was a total new area for Mind’s Eye. Daniel Flores and Fredrik Grünberger produced, arranged and mixed the 12-song album through June until August 2001. In July 2001 Mind’s Eye singed with German label Rising Sun (Angra, Dreamscape, Black Symphony). The reviews for “a work of art” where amazing and everything was going in the right direction again for the band until the inevitable happened: the label went bankrupt and Mind’s Eye left Rising sun records. After that Mind’s Eye took a big blow and they decided to take a long break to gather their troops again. This was a good period for both Johan Niemann and Daniel Flores who recorded 10 albums together during the time off Mind’s Eye. Andreas Novak went on the Swedish TV show Fame Factory gaining great success and finally signing a record deal with MTM record/Germany for his first solo album called “Forever Endeavour” produced by Daniel Flores. Having much success and being studio musicians that worked all over the world, the guys of Mind’s Eye got the urge to come back and make a new album but Fredrik Grünberger, who worked as a stock broker during his time off with Mind’s Eye, couldn’t make it. So he decided to leave the band in order not to stand in their way of making a new album. The guys who worked together since they where teenagers where really broken by this but respected Fredrik’s decision. Bass player Johan Niemann, who also always had played the guitar, took Fredrik’s place and now they where three. Time went by and suddenly the band received great news, they found a new label which would make a re-release of their last 2 albums”…Waiting for the tide” and “A work Of Art” and the release of a new studio album. The label was LION MUSIC, a great label for the band. Still with Andreas Novak on vocals and with the new label Lion Music, Mind’s Eye feels confident and stronger than ever before, to explore the boundaries of new musical territories and to confront a larger audience. Expect the unexpected: here is the new Mind’s eye album “Walking on H2O”. I am always surprised, that I cannot find CDs like this in music-third-world-germany, which - last time I checked - was not that far away from sweden. Thanx for having it for me.